shmups.system11.org • View topic - Any way to get 240p from a PC without using an AMD gpu? Any way to get 240p from a PC without using an AMD gpu? Post subject: Any way to get 240p from a PC without using an AMD gpu? My 4890 just stopped working. The pc turns on but no image. The extron RGB interface shows no signal. This happened with every other AMD card I ever bought, including 2 arcade VGA cards (which lasted 6 months each). It usually happens when I try booting up after not using it for a while. I have never had a single problem with any Nvidia cards and I have owned at least 9 including both consumer and Quadro models. I've broken 7 AMD cards. I hate all AMD hardware! Post subject: Re: Any way to get 240p from a PC without using an AMD gpu? I would have to have five bad power supplies as AMD cards don't last in any of my PCs. It would also have to be bad in a way that only effects AMD cards and never Nvidia. I haven't tried crt emu before. As is seems to work in Windows 7, I guess I'll give that a try if there is literally no other non-AMD solution..
Weirdly, I've only ever had one AMD card go bad on me, and it was still usable in a pinch (artifacting). Do you recall which brand(s) of AMD cards you were buying? I've only ever bought reference cards and Sapphire-brand ones (because I had heard Sapphire produces the references cards). I have a range including sapphire, msi, Asus and a few others. I don't know for sure but my belief is that the weak link with AMD cards is the software and I don't think soft 15lhz helps this.. I guess I am just unlucky with AMD. I know that some others have done ok with them. Still if it wasn't for my 240p need, I would never touch another. I don't like troubleshooting PC problems. In theory, a lot of Nvidia cards will work. People post up all over the place saying "Just get a..." whatever it is; GTX 710, 950, etc. and add your modelines. Some people even talk about the 970 working. But in practice you're likely to get headaches, and those headaches may not be fixable. AMD + crt_emudriver is the only guaranteed route to 15kHz. I'm able to get 240p 15kHz from my GTX 1080 using a DisplayPort - VGA Adapter with no problems at all. I even tried 240p 16:9 resolutions with success to play Sonic Mania or Shovel Knight. Do Cards like the 1080 still have a DAC, so DP can output native VGA or do you use an active DP to VGA converter ? I highly doubt that they still have a DAC. Even some older models were not able to output VGA through DVI-I anymore. The GeForce 900 series was the last VGA holdout. I was just looking on one of my workstations that has an Nvidia Quadro 6000 (which can output analog RGB through DVI-I and they seem to offer 15khz 480i natively - I.e. As one of the hardcoded built in resolutions. I can set it to 240p as a custom resolution but it doesn't seem to like staying in 240p once I shut it down. It makes sense that that this generation of high end Quadro cards would allow 15khz because people who worked in TV / broadcasting would have used them. I'm wondering if I can make this work for my set-up using an HD monitor for Windows and my arcade monitor as a 2nd screen for MAME. How do I check the "dot clock" for the custom resolutions I create? Isn't this the apparent issue in modern GPUs and the thing that is apparently solved by an arcade VGA? I have a SONY BVM 20F1E and I would like to be able to play the arcade games I played from 1975 to 1998 at home. I have a ThinkPad T420 at home where I connected an NVIDIA 750TI via eGPU so that I can play POE. Now I know that an ATI 6450 with VGA end the best choice is I right? I can also use these on the eGPU. My laptop has an Intel Core i5-2540M (2.60GHz, 3MB L3, 1333MHz FSB would be the long or I need this Intel CPU? I also bought an Extron RGB 190xi for what is that good? What cable do I need then I have VGA on BNC is that ok? and lastly which version of groovymame + mame you should use i downloaded this version 0200_017 as well as the MAME 0200 is that ok? PS: I wanted to do that before with Raspberry PI 3 and VGA666 but I read that the emulation of RB3 is not enough. what I meant was, that you maybe want to try to get 240p from your Nvidia setup before going for a different video card ? but is this ok what i typed the best way is groovymame and i dont Need that cpu? and what is this extron do? A few postinge above you'll find the link to a HDMI to Converter from Amazon (Germany even). You can use the Extron to convert from RGBHV (from the D/A dongle) to RGsB or RGBs for your BVM. Using an hd display as main and crt as secondary can be a little tricky in windows 10. 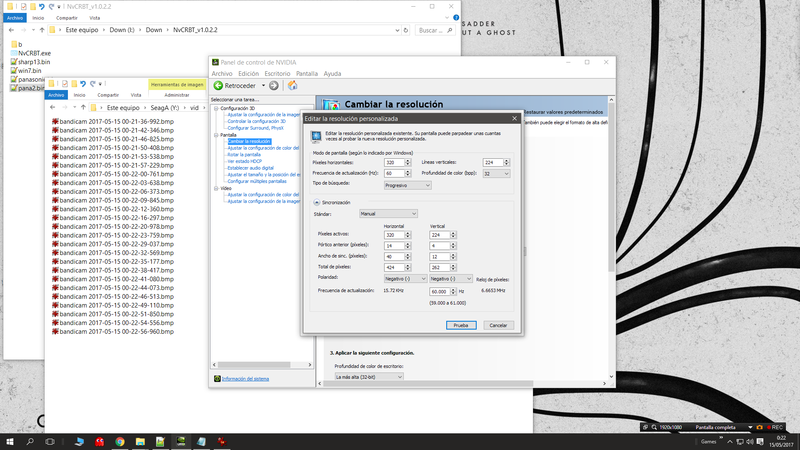 What I do is to plug both screens, leave the analog disabled in nvidia control panel, then use a program called quick display changer 2 to create a desktop access that will force this screen enviroment for later. After that I enable the analog crt, create the custom resolutions I need and leave for the last the resolution I want the crt desktop to be. I accept this last resolution, nvidia control panel will let you then select this resolution for the crt (all previous resolutions wont be shown but don´t worry, they are in the registry), set the crt to this resolution, then using the nvidia control panel disable the hd display, the crt should be working at the desired resolution (if not try again), then close the nvidia control panel and click the quick display changer access created before in the desktop (so we are back at hd display enabled, crt disabled). Ps.- In case you want 480i for later consoles like dreamcast or ps2, forget it, it´s broken with nvidia. Ps2.- And you need to reboot the pc so the emulators can use the new resolutions. Is this really one of the differences between Nvidia and using AMD with CRT Emudriver? To run a modern flatscreen + 240p CRT, on CRT Emudriver all I needed to do was run CRT Emudriver (and follow their setup directions), pick my 240p CRT as the one to get the custom 240p modelines, then the only extra thing I had to do was to change MAME.ini's "screen" settings to be “\\.\DISPLAY2”, and all my regular Windows stuff works through the motherboard's built-in 4K HDMI output (Intel HD Graphics 630) on my 49" TCL TV, and when I launch MAME it boots up on the 240p CRT automatically (via the HD 6450 video card). Of course it initially took me like 30 hours of reinstalling windows about 20 times to get everything working (especially MAME which is so archaic and counter intuitive it's not even funny) how I wanted it without screwing something up along the way - but that was learning pains and now I can get it up and running in maybe 15 minutes lol. Ps.- You can also use mame builds like mameui32fx which are pretty straightforward, but you need to set the resolutions manually. I was able to make my Nvideo Quadro 6000 (ferni generation) output 240p 15.7khz without any mods or special drivers and, through any of it's ports. It has three DVI ports which are all capable of DVI-d and DVI- I. But.... and this is a big one, I could only make it switch to 15hhz for everything. I.e. I wasn't able to make mame output 15khz while Windows was in 31khz. Also, I wasn't able to generate the number of custom resolutions needed to run a broad portfolio of mame titles at native res. It only allowed a few (which is the real benefit of soft 15khz and crt emu). None of my GTX 680's and 580's were able to generate a permanent useable 240p / 15khz. One allowed it for a few seconds and then blue screened on me. The pro grade Quadro cards seem to offer more flexibility. But, they still require one HD monitor to be connected just in case. Obviously, any card can do 240p 120hz at 31khz. But, it just does not look or feel the same as 240p 60hz, even when played on the same monitor. I have tried. I once got ok results using a 480p (native) LCD data projector with 240p / 120 fps. That's the only scenario where I would use 120hz 240p. That was me actually. I posted the DP -> VGA adapter in the thread already. I tried using the custom resolution settings from nvidia and it kinda worked, but changing between resolutions was a mess. Somehow only one custom resolution was possible. I found another solution. It is imporant to remove all resolutions and just insert your custom resolutions. Otherwise some funky stuff happens. I did some resolutions from 240p up to 720p as I use a Multiformat BVM. You also see some 240p widescreen resolutions for different games (Sonic Mania and Shovel Knight). There you can choose between the different resolutions. There are also some resolutions in between that are not in CRU. Do not use these as in my case it goes with 720p and does some horrible unsharp scaling. Btw, I'm using a Extron RGB 202Rxi (it has a DB9 connection instead of a standard VGA, but I got it for cheap). I also had success with a Extron RBG 109xi. Also, this is real 240p. Meaning 60Hz / 15.5kHz-ish (around 16kHz in my case). 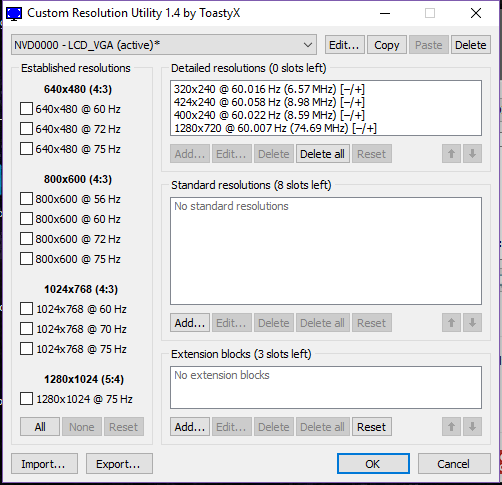 You can actually use the nvidia custom resolution tool to test the resolutions. That's what I did. I then copied the settings to CRU. But saving more than one custom resolution was just not possible for me. Although more than one custom resolution was shown in the tool I was only able to choose the most recently created resolution. Yes, I wanted to have my other screens active as well especially when I'm using 720p. It seems to work quite well though. I only change to 240p if needed. Otherwise it will stay in 720p. But what do you mean by not saving?, you have to reboot the computer so the applications like emulators can detect and use them. You wont be able to choose them for desktop use in the nvidia control panel though, only the last one you set. 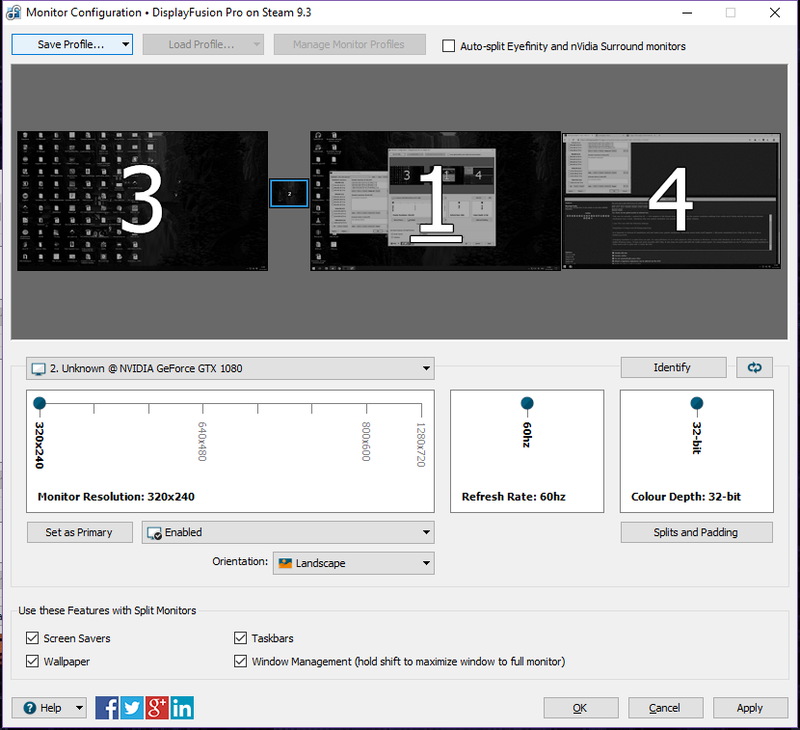 The Nvidia control panel for their pro grade Quadro cards has more options for stuff like this and fewer restrictions as they are designed to be used in display walls and, obviously for graphic design too. The latest generation of Quadro cards is too expensive for this but the fermi generation (like my Quadro 6000) and even the following gen (with cards like the K5000) are fairly cheap on eBay. Maybe the Quadro drivers even work with their gaming cards. Might be worth a try to see if it helps at all. Perhaps one day, Nvidia will wake up to the fact that a lot of users want and / need backward compatibility as retro gaming is increasingly popular. There is a huge back catalog of games people still enjoy playing and it's frustrating that the limiting factor is the gpu which is specifically sold for gaming. Ahh, I was not aware of that. That does not suit my needs though as there are some games where I can not change the resolution. It just picks the desktop resolution when going into fullscreen. Ps.- Although not so much for interlaced 15khz resolutions (for dreamcast and ps2 emulation), they look ugly @240p. Perhaps one day, Nvidia will wake up to the fact that a lot of users want and / need backward compatibility as vintage gaming is increasingly popular. There is a huge back catalog of games people still enjoy playing and it's frustrating that the limiting factor is the gpu which is specifically sold for gaming. Don't count on it, Nvidia doesn't like their consumer and pro lines intersecting.